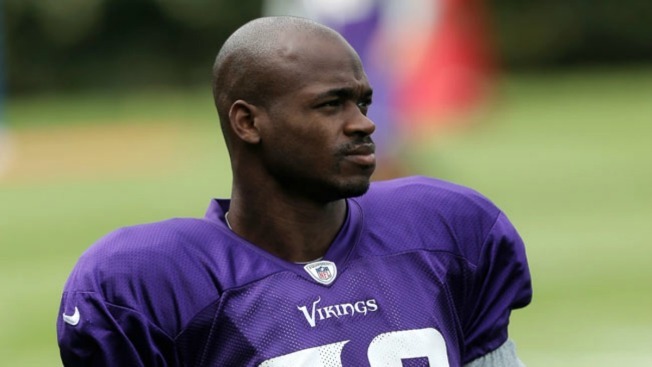 Violencia intrafamiliar - Adrian Peterson, corredor de los Minnesota Vikings, fue suspendido de la NFL por una supuesta agresión a su hijo de cuatro años. La sanción establece como límite el 15 de abril, por lo que este diciembre el jugador se dijo dispuesto a dejar la NFL para ir a cumplir otros sueños, ya que está enojado con el manejó que se dio a su proceso disciplinario. Here’s how Fantasy Football is ruining real football: Adrian Peterson. To the Cowboys. Sorry, but here in the actual NFL it ain’t happenin’. It’s a fan-concocted, media-driven wish list that – at least via conventional means – just isn’t practical. At this point it’s a suburban legend, fueled by those who “want” it to happen because in their Fantasy Football leagues it “could” happen. Peterson, of course, is the NFL’s best running back. He sat out all but one game in 2014 after admitting to punishing his son with a switch. And now the Vikings are considering their options. Considering the imminent free-agent departure of DeMarco Murray, certainly the Cowboys could use a primo running back. But, as of yet, Peterson hasn’t asked to be traded and Minnesota hasn’t announced plans to cut him. We can surmise that Peterson, a Palestine native, would love to return to our football-lovin’, corporal punishment-ingrained state. Peterson’s salary over the next three years is, gulp, $13, $15 and $17 million. Nobody would absorb that kind of contract, especially the newly crowned NFL Executive of the Year, Cowboys owner Jerry Jones. The Cowboys are likely going to balk at paying Murray more than $6 million a year, so why would they almost triple that amount to acquire another back who just sat out a season because of legal troubles? A Peterson-to-the-Cowboys deal is like driving amidst Thundersleet: Doable, but very dangerous. And, in the end, the reward probably isn’t worth the risk.